Historians continue to debate the importance of the alliance system as one of the causes of World War I. At the start of World War I in 1914, all three Triple Entente members entered it as Allied Powers against the Central Powers: Germany and Austria-Hungary. However, the Triple Entente, unlike the Triple Alliance or the Franco-Russian Alliance, was not an alliance of mutual defense. Thus, Britain felt free to make its own foreign policy decisions in the 1914 July Crisis. Russia had previously been a member of the League of the Three Emperors, an alliance in 1873 with Austria-Hungary and Germany. The alliance was part of German Chancellor Otto von Bismarck′s plan to isolate France diplomatically; he feared that France's revanchist aspirations might make it to regain its losses in 1871 after the Franco-Prussian War. The alliance also served to fight against progressive sentiments, which the conservative rulers found unsettling, such as the First International. However, the League faced great difficulty with the growing tensions between Russia and Austria-Hungary, mainly over the Balkans, where the rise of nationalism and the continued decline of the Ottoman Empire made many former Ottoman provinces struggle for independence. The situation in the Balkans, especially in the wake of the Serbo-Bulgarian War and the 1878 Treaty of Berlin, which made Russia feel cheated of its gains made in the Russo-Turkish War, prevented the League from being renewed in 1887. In an attempt to stop Russia from allying with France, Bismarck signed the secret Reinsurance Treaty with Russia in 1887. The treaty assured that both parties would remain neutral if war broke out. 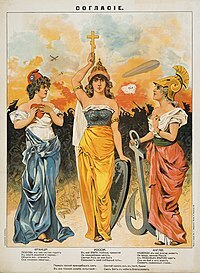 The alliance between Russia and France and Bismarck's exclusion of Russia from the German financial market in 1887 prevented the treaty from being renewed in 1890. That ended the alliance between Germany and Russia. After the Reinsurance Treaty was not renewed in 1890, Russian leaders grew alarmed at the country's diplomatic isolation and joined the Franco-Russian Alliance in 1894. In 1904, Britain and France signed a series of agreements, the Entente cordiale, mostly in solving colonial disputes. That heralded the end of British splendid isolation and was partly a response to growing German antagonism, as expressed in the expansion of the Kaiserliche Marine (Imperial Navy) to become a battle fleet that could threaten the supremacy of the British Royal Navy. The Entente, unlike the Triple Alliance and the Franco-Russian Alliance, was not an alliance of mutual defence and so Britain was free to make its own foreign policy decisions in 1914. As British Foreign Office Official Eyre Crowe minuted, "The fundamental fact of course is that the Entente is not an alliance. For purposes of ultimate emergencies it may be found to have no substance at all. For the Entente is nothing more than a frame of mind, a view of general policy which is shared by the governments of two countries, but which may be, or become, so vague as to lose all content". In 1907, Britain and Russia signed the Anglo-Russian Convention of 1907 to end their rivalry in Central Asia, nicknamed The Great Game. France and Britain had signed five separate agreements regarding spheres of influence in North Africa in 1904, the Entente cordiale. The Tangier Crisis later encouraged co-operation between the two countries from their mutual fear of apparent German expansionism. Russia was defeated in the Russo-Japanese War, which resulted in less concern over Russian imperialism and encouraged Russia to secure its position elsewhere. France was already allied to Russia in the Dual Alliance. Britain was frightened about the rising threat of German imperialism. Kaiser Wilhelm II had announced to the world his intentions to create a global German empire and to develop a strong navy. Britain, traditionally having control of the seas, saw that a serious threat to its own empire and navy. In 1907, the Anglo-Russian Entente was agreed, which attempted to resolve a series of long-running disputes over Persia, Afghanistan and Tibet and helped to address British fears about the Baghdad Railway, which would help German expansion in the Near East. During the Franco-Prussian War of 1870–1871, Prussia defeated the Second French Empire, resulting in the establishment of the Third Republic. In the Treaty of Frankfurt, Prussia forced France to cede Alsace-Lorraine to the new German Empire. Ever since, relations had been poor. France, worried about the escalating military development of Germany, began building up its own war industries and army to deter to German aggression. Also, France developed a strong bond with Russia by ratifying the Franco-Russian Alliance, which was designed to create a strong counter to the Triple Alliance. France's main concerns were to protect against an attack from Germany and to regain Alsace-Lorraine. Russia had by far the largest manpower reserves of all the six European powers, but it was also the most backward economically. Russia shared France's worries about Germany. After the Germans started to reorganise the Ottoman army, Russia feared that they would come to control the Dardanelles, a vital trade artery that carried two fifths of Russia's exports. There was also Russia's recent rivalry with Austria-Hungary over the spheres of influence in the Balkans. Russia had also recently lost the humiliating Russo-Japanese War, a cause of the Russian Revolution of 1905 and the apparent transformation into a constitutional monarchy. To counter its enemies militarily and politically, Russia sought to revive the Franco-Russian Alliance. Although it was perceived as useless during the war with Japan, the alliance was valuable in the European theatre. Russia also signed the Anglo-Russian Convention of 1907 with Britain to counteract the threat of the Triple Alliance. The alignment of the autocratic Russian Empire with Europe's two largest democracies was controversial on both sides. Many Russian conservatives mistrusted the secular France and recalled British past diplomatic maneuvers to block Russian influence in the Near East. In turn, prominent French and British journalists, academics and parliamentarians found the reactionary tsarist regime distasteful. Mistrust persisted even during wartime, with British and French politicians expressing relief when Tsar Nicholas II abdicated and was replaced by the Russian Provisional Government after the February Revolution in 1917. An offer of political asylum for the Romanovs was even withdrawn by the British king for fear popular reaction. Also, France never brought up the subject of asylum with the deposed tsar. ^ Edgar Feuchtwanger, Imperial Germany 1850–1918 (2002). p 216. ^ Gildea 2003, p. 237. ^ Ruth Henig, The Origins of the First World War (2002), p.3. ^ Hamilton, K.A. (1977). "Great Britain and France, 1911–1914". In Hinsley, F.H. British Foreign Policy Under Sir Edward Grey. Cambridge University Press. p. 324. ISBN 978-0-521-21347-9. ^ Gareth Russell (2014). The Emperors: How Europe's Rulers Were Destroyed by the First World War. Amberley. pp. 164–65. Clark, Christopher. The Sleepwalkers: How Europe went to war in 1914 (2012), pp. 124–35, 190–96, 293–313, 438–42, 498–505. Hughes, Michael. Diplomacy before the Russian Revolution: Britain, Russia, and the Old Diplomacy, 1894–1917 (2000). Kennan, George F. The decline of Bismarck's European order: Franco-Russian relations, 1875–1890 (1979). Langer, William F. The Diplomacy of Imperialism: 1890–1902 (1950) pp 3–66.